Simple question: Would you want to live in one of his houses? I wouldn't, for two main reasons. Most important is the way a Frank Lloyd Wright house never becomes your home; instead, you move in and become the curator of one branch of the Frank Lloyd Wright museum. You're just the custodian in a monument to his genius. For the other, I wouldn't want to be in charge of (let alone pay for) the upkeep. Wright couldn't resist trying out innovative building techniques -- which has meant in practice that many of his houses are in semi-constant need of expensive repair. All in all an estimable estimation of a man who has, like all men, been overrated since his death. From all accounts, dealing with Wright when alive was like dealing with a man who had mistaken himself for God. Not that there's anything wrong with that. Michael also goes on to note something that I caught my attention in the Wall Street Journal: the shabby state of that most iconic of Wright buildings, Falling Water. I realize that irony is dead, but for just a moment it sprang back to life when I learned that this house was broken from the day before it was finished. The price tag to bring it back to snuff? A cool $11 million. Oh well, I suppose it is a mere bagatelle when you think of all the photos that the house has spawned, from the same angle, year after year and decade after decade. Falling Water seems to be eternally spared from the wrecking ball, but, if I recall the Journal�s article correctly, the same cannot be said for a number of the other 100 odd Wright homes in existence. The reason? They sit on some fine sites, but nobody wants to live in their tiny rooms any longer. I'd score the whole thing six, six and one even for Wright. 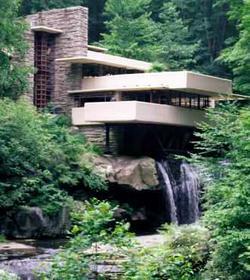 I mean, Falling Water's a nice house, but I wouldn't want to live there.